Welcome to K is for Kinetics! 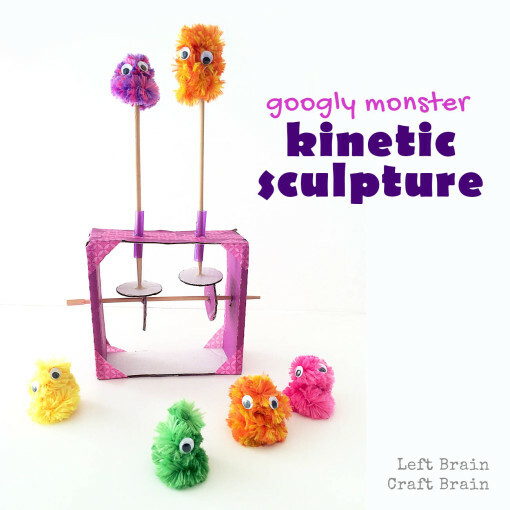 As part of this month’s A-Z STEM blog series, we created Googly Monster Kinetic Sculptures. 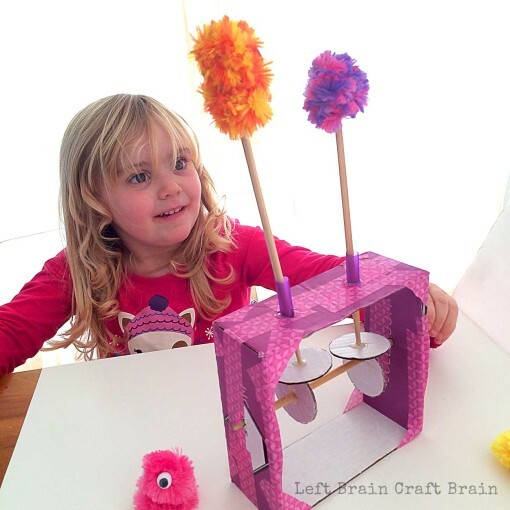 They combine engineering with a bit of art to make a fun, movable puppet show. Plus, they’re a great way to teach about kinetics, the study of forces acting on mechanisms. This post contains affiliate links. What are Kinetic Sculptures and How Do They Work? Kinetic sculptures are art that rely upon perceivable motion to create an effect. The motion can be powered by machines, by the wind (think mobiles) or by you. Famous kinetic sculptors like Alexander Calder used motion to change how a person perceives the pattern and colors in their art. Today’s project uses mechanics to give motion to a static object and is of the automata style of kinetic sculpture. Automata use mechanical elements like cams, followers, cranks and pulleys to make parts of the sculpture move. We used recycled materials like cardboard and chopsticks to create the parts in the sculpture. Cardboard disk cams translate a chopstick’s circular motion into up and down and circular googly monster motion. Here are the Googly Monster Kinetic Sculpture cams and followers in action. 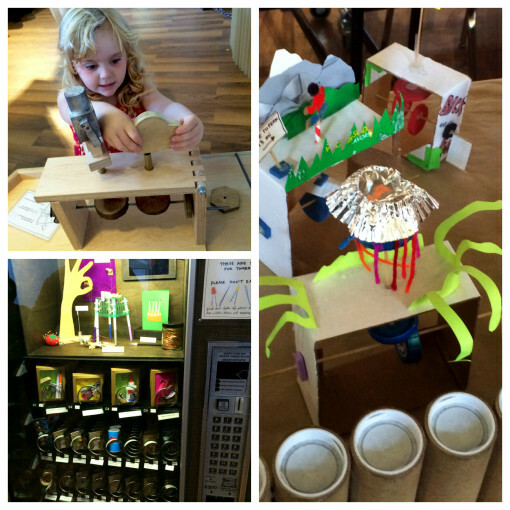 This post was inspired by our visit to San Francisco’s Exploratorium. In their Tinkering Studio, you can take a workshop to build these kinetic sculptures. The Babe is a little too young for the workshop, but we took pictures and built ours at home :) By the way, this post is more for elementary aged kids than the preschoolers, but my nearly four year old daughter really loved being an assistant and playing with the sculpture. 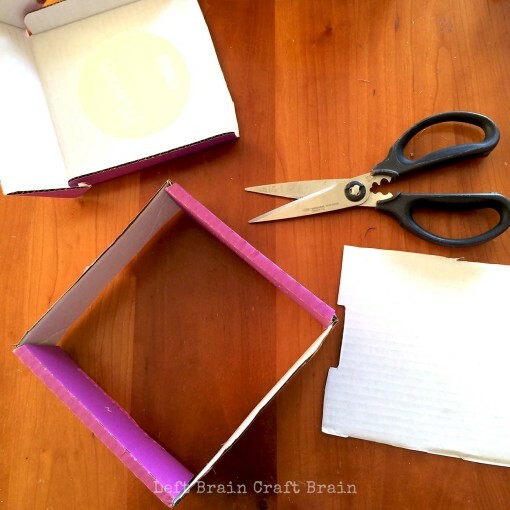 Make your sculpture frame: Cut top and bottom off of your cardboard box. Put unused cardboard aside for another step. 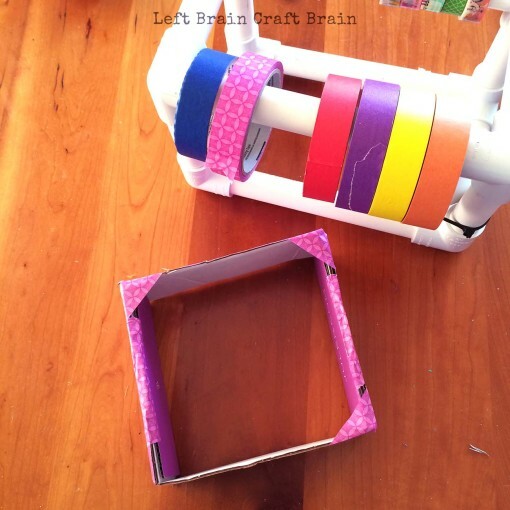 Reinforce the sculpture frame: Reinforce sides and corners with masking tape. We used cute masking tape that we store on our DIY PVC Pipe Tape Dispenser. For the puppet chop stick holes: Poke two holes in the top of the box with your skinny pointy item. Where you ask? You need them far enough apart that the mechanisms won’t bump into either each other or the sides of the box. In my 6 1/4″ inner diameter box, I placed the holes at about 2″ and 5″ from the left side. Poke a pen through the holes in the top to make the holes wider. Insert a 2-3″ long piece of straw so that half is above the box and half is inside the box. Glue around the straw and hole with the glue gun. For the cam chop stick holes: Mark a hole half way down both sides of the frame. Poke with your skinny pointy item and then make the holes bigger with a chopstick. 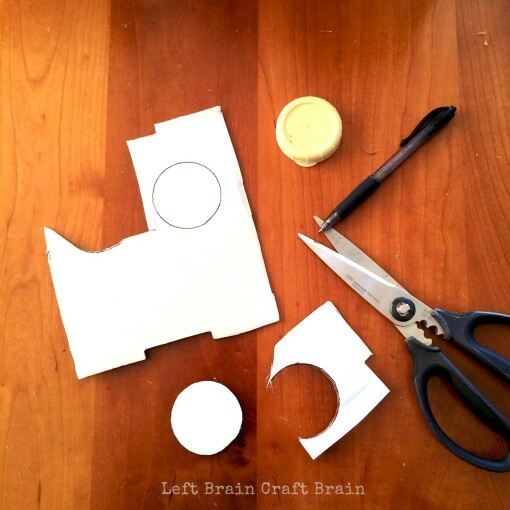 Make your sculpture cams: Cut 4 ~2″ circles from the unused top or bottom of the cardboard box. These are your cams and cam-followers. Mark the center of two of the cardboard circles. Balance the pointy tip of a chopstick in the hole of the cams. Glue in place with the glue gun (you might need to hold it upright for a minute while the glue cools down). This combo is called the cam-follower and the push-rod. To make your monster turn in a circle, take a cardboard circle and mark the center. Poke a hole all the way through the cam with your skinny pointy item. Then poke a chopstick all of the way through the hole. Pipe a bead of glue all the way around the circumference of the cam to give the cam some grip. To make your monster go up and down and turn in a circle, mark a cardboard circle half way between the center and the edge. Poke a hole all the way through the cam with your skinny pointy item. Then poke a chopstick all of the way through the hole. Pipe a glue edge on this cam as above. The picture below shows where to attach the chop sticks. Make your googly monsters: Instructions to make these adorably easy googly monsters are in the Googly Monster Finger Puppets post. Click through for the easy how-to. Feed one chopstick through a side hole, then add both cams and feed through the other side holes. 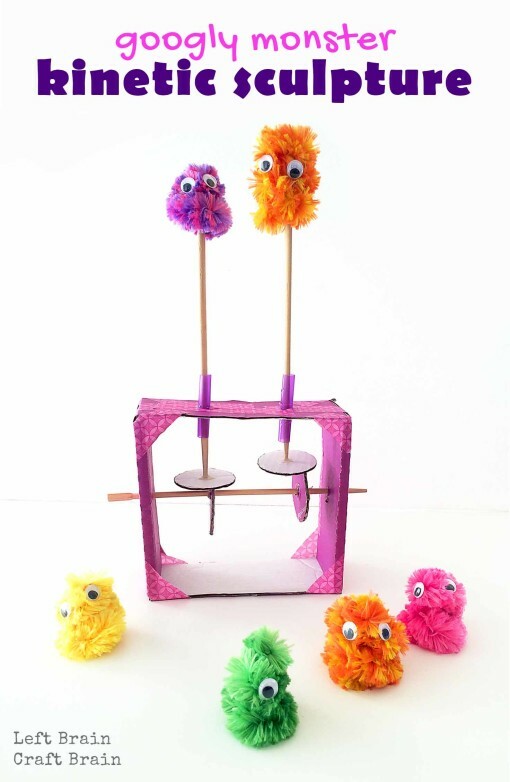 Feed each puppet push-rod through a straw hole and put a googly monster on top. Align the vertical cams with puppet cam-followers so that the puppets turn and raise up and down. Once you’ve found the right spot for optimum movement, glue the vertical cams in place. There are a few more things you could do to your sculpture… Decorate it. Add a crank handle to the chopstick. Add washers to the puppet cam-followers if they seem to be popping off the vertical cams. Want to make your monster get a real workout? Or have your older kiddo get a harder brain workout? 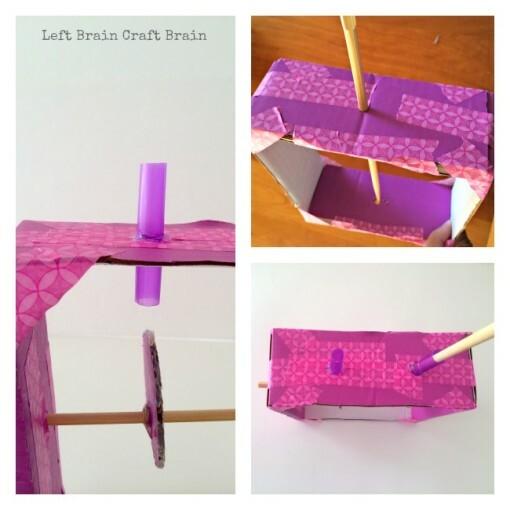 Teacher Lizabeth Arum has posted an amazing middle-school level Automata Curriculum. You’ll find information on more advanced cam/follower configurations as well as the math behind how these work. 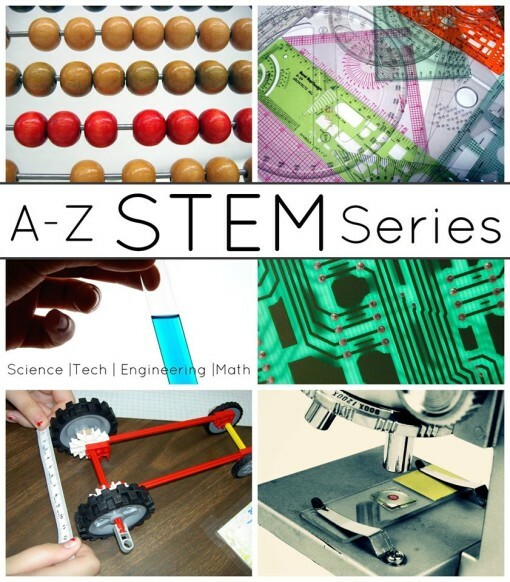 This post is part of a series this month called A-Z STEM. 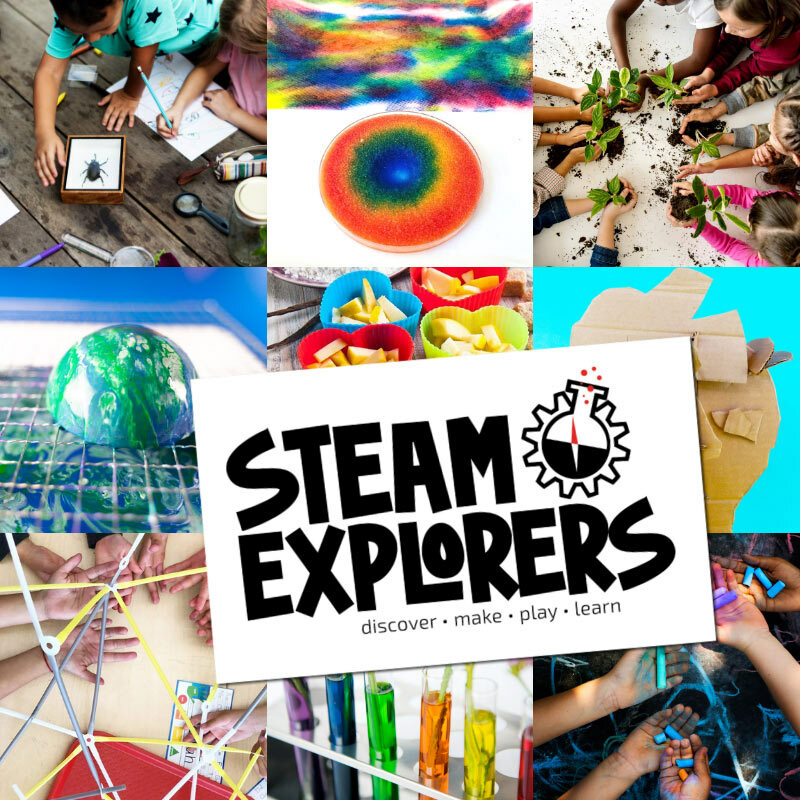 Every day is a new letter and new ways to learn and play with Science, Technology, Engineering and Math. Click through to Little Bins for Little Hands to see a list of all the projects. 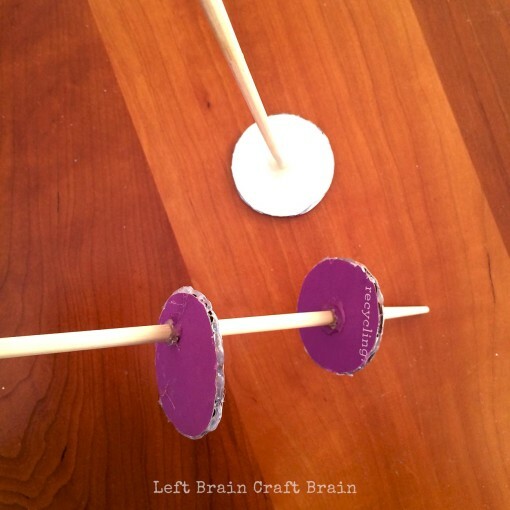 To be the first to see what Left Brain Craft Brain has in store for the letters V (for viscosity) and W (for weight), sign up for the Left Brain Craft Brain newsletter or follow me on Pinterest. This is a lovely idea. You gave me so much inspiration! thank you!